Malie Organics (formerly known as Malie Kauai) is based on the Hawaiian island of Kauai, known as "the Garden Isle," and its products draw their inspiration and their ingredients from the dense vegetation of Kauai's rainforests. "Malie" is Hawaiian for "calm, serene, tranquil," and the company places a lot of emphasis on the natural origins and aromatherapeutic benefits of its various skincare, bodycare, and home fragrance items. This Body Cream's formula includes familiar ingredients like aloe vera, chamomile, and jojoba seed oil, as well as more characteristically Hawaiian extracts of coconut, kukui seed, and awapuhi ginger. It's available in four fragrances: Coconut Vanilla, Koke'e, Mango Nectar, and Plumeria. According to Malie, all the scents are created through a hydrosol distillation process, capturing the "spirit" of the local botanicals. 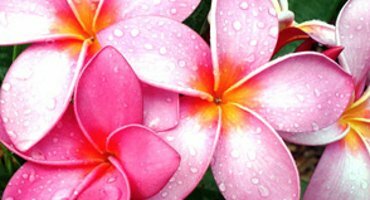 Plumeria, also known as frangipani, is a flower prized for its fragrance and traditionally used in Hawaiian leis. I've never been to Hawaii or smelled an actual plumeria plant, so I can't vouch for this scent's fidelity to the flower; but it's a very feminine fragrance, on the strong side without being overwhelming, and it's definitely sweet. Its plumeria note comes across as a bolder cousin to magnolia, creamy and a little bit lemony, but it never feels as heady as a gardenia or tuberose fragrance. It also has a bright, fruity aspect, like a sorbet blended from mango, pineapple, and maybe a few raspberries. Plumeria Organic Body Cream could be worn as a delightful complementary layer beneath Ormonde Jayne Frangipani (although Malie's interpretation of the flower is much fruitier), L'Artisan Parfumeur Ananas Fizz (to bring out the lotion's pineapple note), or Monyette Paris Coquette Tropique. Malie also offers plumeria-scented body wash, liquid hand soap, soy candles, reed diffusers, and room spray, so that you can create a complete tropical-garden ambiance wherever you are. Malie Organics Plumeria Organic Body Cream sells for about $27-30 (7.5 oz). For buying information, see the listing for Malie under Perfume Houses. See also: Malie's Organic Coffee Macadamia Body Polish. Note: top image is Pink Plumeria [cropped] by sunny_2046 at flickr; some rights reserved. Thank you for the review! I love tropicals and can’t recall if I have tried anything from this line. Plumeria is a hugely difficult scent to get right – if you have never smelled the real thing it’s probably easier to enjoy perfume versions. I would be interested to try the Koke’e – it is a green scent based on the malie vine. So few tropical scents don’t involve fruits or flowers! Thanks, Tama! I do have a rare “tropical” moment… this must have been one of them! Thanks for the review, Jessica! I’d like to try this — I lived in Hawaii years ago and, like Tama said, it does seem that plumeria scents often don’t smell like the real thing to me (or at least how I remember it). This would also be a good gift for my mom, who loves plumeria. I’ve never been to Hawaii, but I’d love to make the trip someday! Oh Jessica–your reviews always seem to get my wallet involved! I am btw, really enjoying those Pattern body washes from a few weeks ago—great products. I was especially surprised by how much I like the Cucumber one (since I generally don’t like cucumber at all!) and who can resist the energizing scent of Eucalyptus!? anyhoodles…..back to the lotion in question—these sound amazing—plumeria is a little scary—smells good, but tends to overpower my nose and get a little headachy after a while. But the others sound yummy…investigation shall ensue…. Hi Daisy! Sorry about the wallet issue, hee. The quality of this lotion is quite nice; it’s not really thick enough to be a “cream,” but it works well as a medium-weight lotion. So glad you liked those Pattern body washes… me too! have you tried the beauty oils? I’d hate to grease up and slide thru the day….but they sound really appealing…..the coconut is making me drool! Daisy, not yet, but I’m curious! I love body oils in winter. Nice review, Jessica. I think I’d be interested in body washes from this line; they’re a bit pricier than I usually go for. Like Tama, I think Koke’e sounds so good! Joe, You’re right, the price is a little high… I got my lotion 1/2-price at a local boutique that was closing its doors. But it *is* very nice quality, and has a good ingredients list! Last summer when I was visiting my sister in Hawaii I discovered this, and REALLY liked it! I refrained from purchasing however because I had only carry on luggage and figured it would be snatched away at security on my flight home. This reminds me that I’d like a bottle, perhaps for the summer. Thanks for the review Jessica! Sarahbeth, It would have been terrible to lose your fancy toiletries at the security checkpoint! Now that you’re home, you can shop. Thank you for this review, Jessica. I like this line, but they are sure pricey! The coconut-vanilla lotion is great, and while I haven’t tried the plumeria lotion, I did splurge on their plumeria reed diffuser. It is powerful AND realistic! Note to Tama and Joe: I sniffed the maile leaf one (Koke’e), and wasn’t convinced. I want to try it again, though, because the idea intrigues me greatly! Haunani, It’s a nutty-sweet coffee, like a flavored coffee… quite gourmand. And it has the perfect scrubby-but-not-scratchy texture. I haven’t been to Hawaii since ’93. Hearing (or reading) that someone is trying to keep the integrity of the flower that is used in most leis sounds really appealing. I will try and find this a little cheaper, and if not then I will just try the lotion for starters. I wish they had a traveler set at a lower cost. NaturalSelektion, A trial-size set would be a great idea! I love trying things that way. I think I’m going to have to try this one. I was in Hawaii this past January, and if this could give me even a hint of the islands, it would be worth it. Yes, my lei was made of plumeria. When they started to wilt, they ended up in my bath. It was a very subtle scent by then, but I really liked it. Oh, how lovely. The only lei I’ve ever had was the plastic one my parents bought me at Disneyworld’s Polynesian Village resort, waaaaay back in my childhood. No scent, but it looked fabulous to my young eyes! I can’t believe it! Since this morning I was desperately searching the fragrance websites to find a frangipani perfume, because I like soo much my Palmolive shower gel with frangipani. I wanted some time ago to post here two questions: does anybody knows of fragrances that smell close to Palmolive LE Madagascar Sunset (divine frangipani) and Marakesh Sunrise (divine ylang-ylang)? Please, help me! Hi Raluca, I haven’t tried too many frangipani perfumes, but I do know that Ava-Luxe offers a Frangipani, and you might also want to try Monyette Paris’ Coquette Tropique or Lucy B’s Pink Frangipani. I’m hoping a few other readers will offer some suggestions, too! Thanks, Jessica, I will try Monyette, as it is the only easily available. Is Ava Luxe back in business? Yes, she is! and she has an Etsy shop now.